concerning TI SmartRF Studio 7. For those who have not personally suffered the experience, choosing radio register values is an absolute pain. In this brief article, I will demonstrate a method for extracting settings in bulk from SmartRF 7 Studio for use in other projects. Suppose that a program should configure a CC1110 to operate on a particular frequency, in a particular encoding, etc. The code will like the following, which is from the CC1110 examples. This will generate a carrier wave near 823 MHz, as the 2.433GHz FREQ value is outside of the allowed range. 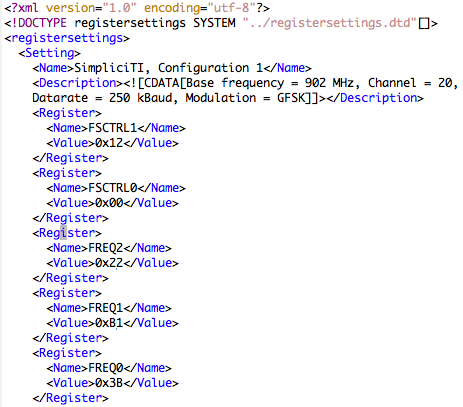 To choose a different center frequency, the engineer is expected to either find the register's definition within the datasheet or use SmartRF Studio, a screenshot of which is below. The software is a Windows application for communicating with a radio through a serial port. It also allows an engineer to load preconfigured profiles for certain types of modulation, such as IEEE 802.15.4 or SimpliciTI. Once loaded, the settings may be tweaked and loaded into a packet-sniffer firmware for debugging projects. The screenshot above, from SmartRF 6, can provide a decent idea of how infuriating the software might become. For product development, the register settings are to be copied and pasted into opaque source files. It can instill the same sort of anger as an uncooperative web form, even after the old Visual Studio 6 libraries have been located to make it work under Wine. SmartRF 7--at Beta 0.9.1 as of this writing--is a new client under active development, one which seems to have been rewritten from scratch or at least significantly refactored. The old Win32 GUI has been replaced with QT4, making a future Linux or Mac port possible. Most importantly of all, however, is that the default configurations, as well as register explanations, are stored as XML. 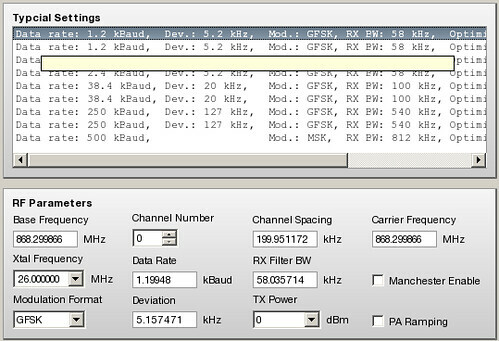 The screenshot above shows how default configurations are chosen for the target radio. Users can select an example, then change any of the settings they like. These configurations are further abstracted into an "Easy Mode" which hides all the messy minutia of radio, abstracting use to standards and channel numbers. These configuration settings are to be found as XML in the config/xml/ directory, organized by chip and presentation. The following is an example of one such configuration file for the CC1110. Patching these configurations allows for the easy addition of new standards. 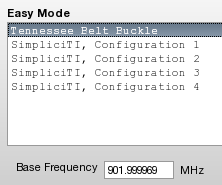 For example, I added support for my Tennessee Belt Buckle radio by adding a new stanza to easymode_settings.xml. 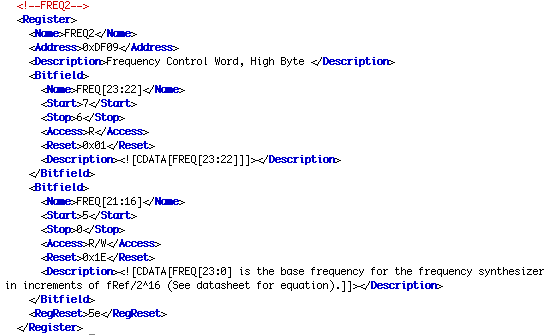 The register definitions and their bitfields are also defined in XML. The following from register_definition.xml for the CC1110 described the FREQ2 register's meaning. 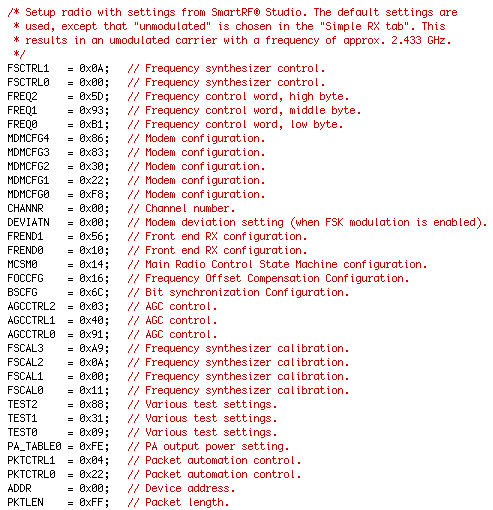 # Simple script for dumping Chipcon register definitions to SDCC header. # Only intended as a rough example. These configuration files should allow for new Chipcon radio applications and development tools to be written in short order. Please contact me if you would be so kind as to write a complete Python class for querying this data. What the heck is a TN belt buckle radio? I don’t even know the way I finished up here, however I thought this submit was once good. I do not recognize who you might be but certainly you are going to a well-known blogger if you aren’t already.